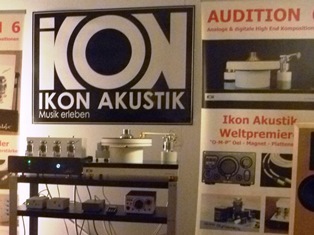 Simon Brown was one of the lucky audiophiles who made it to this year’s Munich High End Show. The following is his rundown of this extraordinary event. IT’S AN AUDIO show, you go to listen, right? Well, think of the Munich High End Show as an audio speed dating event rather than a place to make lifetime commitments. It’s an opportunity to see who you’d like to see again, but it pays to keep in mind that the circumstances aren’t helpful to either party. Downstairs, there were a couple of massive display halls with open stands. Only a few brave souls played music on these open stands, as they had to compete with the general hubbub of show visitors. Generally, it was all look and talk but a couple of stands playing music grabbed my attention simply by how good they sounded in the circumstances. 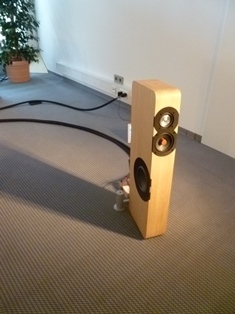 One was Imago, a small Italian maker of an omnidirectional speaker, and another I couldn’t walk past was Joseph Audio (US) speakers on a stand he was sharing with Cardas Cables. The big halls also sprouted occasional sound cabins. While these shut out external sounds, I wasn’t convinced, as they also shut out attendees and needed to work hard to avoid acoustic problems. Some were also simply off-putting because of the queues involved: I was keen to hear the well-reviewed Enigma Acoustics Mythology M1, but clearly everyone else wanted to hear them too. As I only had two days to cover the show, the Enigma stand remained one. 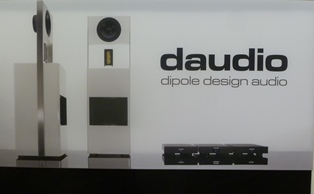 Nevertheless, I enjoyed new dipole speakers from Daudio and later, the Lumin-White & Ayon cabin. Upstairs, there were larger rooms, which should have been better but often weren’t due to sonic leakage from neighbouring rooms. Devialet’s much promoted Phantom micro amp-speaker-sub ‘blob’ (certainly not a box!) is advertised as going down to 16Hz. Strangely, it didn’t seem that deep in the room, but was annoyingly more prominent about three rooms away. 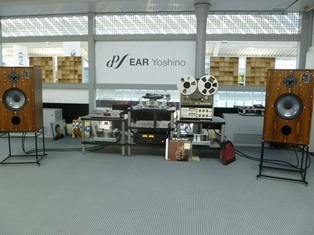 – As a fan of British amplifier designer Tim de Paravicini, I sought out his EAR (Esoteric Audio Research) Yoshino room. This was a haven of enjoyable sound with EAL’s turntable, CD and an EAL modified reel to reel playing through the newly released Graham LS 3/8 speakers. This raised two elegantly gloved fingers to the current convention of narrow fronted speakers with the BBC specified but newly derived speaker featuring a 12 inch bass unit and big dome tweeter. 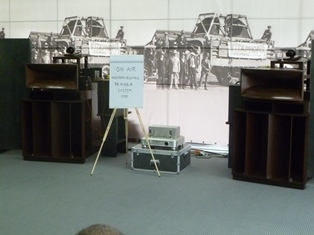 Newsworthy was Technics return to ‘proper’ hi-fi, showing their new Reference Class products. I meant to go back to their room for a listen, but sadly, ran out of time. Many of the German loudspeakers at the show had the stereotypical subtlety and looks of an oompa band, but eventually I learned not to judge by what the gear looked like, as I continued to be surprised by gear that confounded my expectations. It was perhaps unfortunate that the night before the show, I had been at the home of a Munich enthusiast and had a good listen to some rebuilt and very modified Quad ESL57s. Before you cry foul, the best sound at the show was even older, by a good 25 years or so – a full-on Western Electric theatre system (TA4165) from 1933! Resplendent in the Sibatone room, this ancient system was part of a display showing how the Korean electronics company make modern designs using WE as a starting point. I noticed that they took no chances, as the whole lot was running on a 16kW mains filter the size of a whole rack of audio gear. Schick turntables/arms or dcs digital provided some of best of both alternate universe front ends. One of the interesting themes for me as a Kiwi visitor was the prevalence of gear from Switzerland and Greece. I’m guessing that Greece’s misfortunes have forced enthusiasts down the DIY path, which then has spun off some of the more interesting homespun gear. I certainly came away with a fistful of brochures of Greek electronics. Sure, there was lots of German gear – this is Germany after all – but Switzerland is a clearly big player in the high end in the German market. There were a number of rather elegant designs like the soundkaos speakers which went against “clinical Swiss” stereotypes. 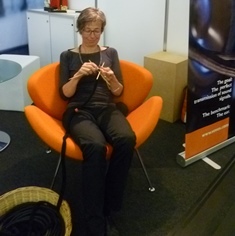 Further disproving stereotypes, Swiss audio cable maker Vovox AG showed a nice sense of humour, having a staff member sitting at the entrance of the stand with knitting needles and wool, seemingly knitting their braided speaker cable. Nice to see someone not taking themselves too seriously! A lot of pixels were consumed by visitors to the show posing in and around some pretty flash cars with their audio partners. 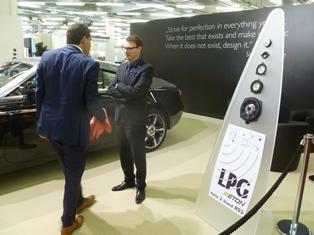 Porsche-Burmester and Bentley-Naim had serious presence on big stands, but the most photographed were Rolls-Royce who interestingly have developed their own system with a number of audio industry partners including German loudspeaker driver manufacturer Eton, who shared the stand. On the subject of speaker drivers, it was one of the things I hadn’t expected as a newbie. There were a significant number of component suppliers. For manufacturers this included suppliers of speaker cones, vibration analysis and front panels. 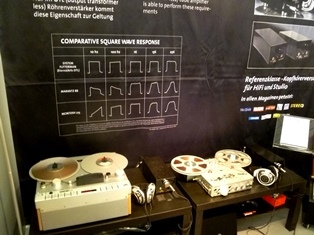 For individual enthusiasts, there were the obvious cable and plug suppliers, but Germany still has a very active DIY audio sector (assisted by magazines such as Hobby HiFi) so there were many drive unit and capacitor suppliers. Buildings were well catered for, with a number of specialist room treatment companies offering panels and integrated loudspeakers. Digital solutions were also very visible, with quite a few room compensation devices and software solutions featured. Fellow Kiwis from Phoenix Audio Systems were there to talk to the digital and headphone providers about their clever gear for improving the hi-fi headphone experience for people with hearing loss. Meridian (UK) had a big release for their MQA audio data compression, but time will see about who adopts it, and when. 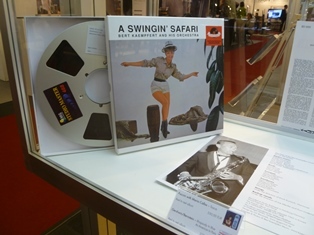 While my predilection as a tonearm maker is understandably towards vinyl, one of the most striking aspects of the Munich High End Show for a first time Antipodean visitor was the presence of reel-to-reel tape. And that’s not just the occasional hardy demonstrator battling the winds of convention but also a number of people offering rebuild services for machines. Several suppliers were even offering pre-recorded reel-to-reel tapes, each for the equivalent price of a budget amplifier. These were usefully being demonstrated via headphones, an opportunity I took – being a teenager of the cassette era rather than the reel-to-reel era. While there was more tape hiss than I expected via the Stellavox player I listened to, the clarity and dynamic range probably meant it was louder than I realised. Much of the analogue gear was new to me rather than new to the market. Germany is apparently the world’s biggest analogue market and there is quite a bit of gear that never makes it to English speaking countries, so it was interesting to see, and useful to me, as I was at the show primarily to talk to turntable makers about using my tonearms. Many of the turntables seem to be modelled on a mad-king’s Bavarian castle. These white/gold creations just needed a couple of cherubs and they would have been entitled to wear ‘Baroque is Back’ embroidered in gold on their choir robes. It also appeared that you were only a serious contender in the World Heavyweight Division of turntables if yours had four tonearms on it. Didn’t see any with three, that must have been so last year. To be fair, the market is big enough to cover all bases and the other extreme, of minimalistic Bauhaus inspired design, was also well represented; to the extent that I mischievously speculated that some of the move to direct drive turntables in the high end was to clean up the aesthetic clutter of belts as much as to clean up the sound. 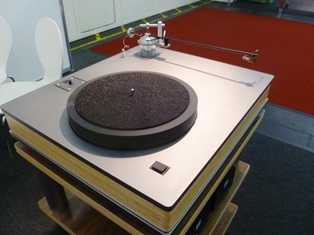 The minimalist camp included new Czech company 440 Audio, whose G1, G3 and G5 turntables were very stylish but so minimalist it was hard to tell if they worked or were early prototypes. Another minimalist gem was the Gyros turntable from new Sicilian company Trinaudio, which matched their elegant but edgy electronics. They even handed out Sicilian chocolate! All sorts of vinyl accessories were represented at the show, and at least half a dozen record cleaning systems were on display. As well as stylus makers, record sleeve companies and record clamp makers, there were a pleasing number of new and second hand LP sellers too – enough for my luggage to be on the wrong side of my baggage allowance. Ouch. However, there were a number of notable analogue releases. The most significant of these is from the Australian design pen of Mark Dohmann for high end brand Thrax. 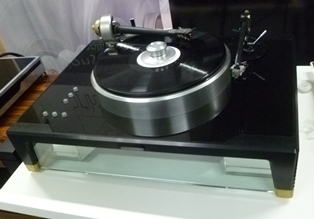 The Döhmann – Helix 1 turntable was making rather wonderful sounds with the full Thrax system. Not being familiar with this Bulgarian based brand who combine very modern design with fresh thinking on valve electronics, I was impressed. Mark, having been the design leader for the Continuum turntable, did a startlingly good demo of the effectiveness of the new Helix 1 suspension as he happily wobbled the flimsy table the turntable was sitting on with no noticeable change in sound: a real party trick that’s just asking for a roomful of revelers to pogo up and down beside it. US-Kiwi-Chinese brand Well Tempered were proudly showing their new Royale 400. The 16-inch (400mm) tonearm on an appropriately sized plinth makes the normal sized platter look small and the armtube, supermodel size zero. Frank Denson from Christchurch was there to introduce it to the world. Booming vinyl sales in Germany had enticed the restart of the PE turntable brand with their new 4040 and 1010 turntables. Their designer was coaxed out of retirement, having designed for Thorens and PE in the past. The result was a pleasing aesthetic mix of wood and piano black. And some nice thinking in a suspended belt drive turntable that looks like an upmarket take on the Thorens TD300 series. 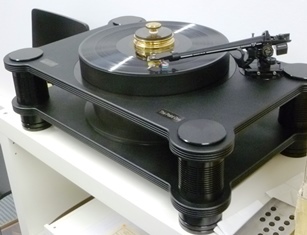 Dutch Brand Van den Hul, known mostly for its cartridges and cable, were proudly showing their new turntable. 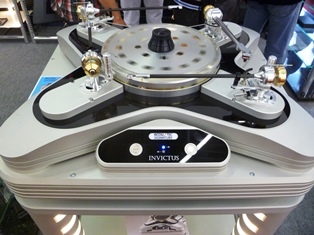 Given their strong links with SME, there looked to be some connection but it had some pretty original thinking in its magnetic bearing, which I understand used magnetic field for the sideways component of the bearing not the thrust (vertical), as is becoming almost conventional in heavyweight turntables. A brief listen was promising, even with the usual mix of totally unfamiliar gear and software. 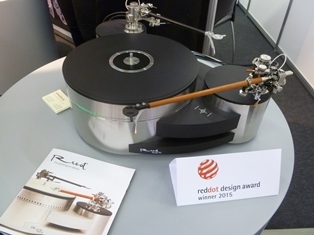 Finally another gem, the Muse 3C turntable from the Estonian makers of the interesting ‘Reed’ tonearm. Not only did it maintain the same strong sense of elegant style but had a pretty interesting drive system that involves two motors driving the sub-platter in symmetric rim drive format. Hate rim drive? It’s a five minute conversion to belt drive! Like many audio shows, there was another higher high-end show nearby. 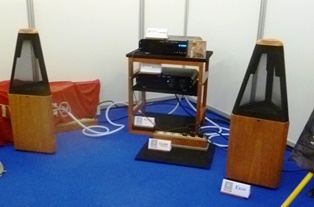 I only had time for a brief visit to the HiFi Deluxe show at the Marriot Hotel, but the rooms were mostly separated from each other to reduce noise pollution and there was more possibility of good demos. A number of manufacturers had a foot in both shows. As per the main show there were some rooms that were more bling than sing but there were also stunning sounds, like the Pear Audio turntable (aka Nottingham Analogue spinoff) being demoed through handmade Japanese Concert Fidelity amplification and American ESP loudspeakers. These were improbably set up to the sides of the room but managed to image stunningly well while producing an effortless sound. * Simon Brown is the man behind designbuildlisten.com and the internationaly well-reviewed The Want tonearm.